Josselyn Grace Alcala is officially 2 years old! 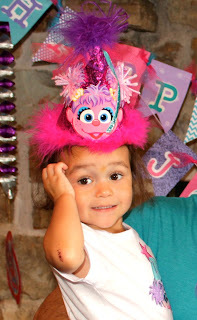 If you read my previous blog post "Planning an Abby Cadabby Birthday Party" then you know that I have spent the last few weeks planning an Abby Cadabby birthday party for my little big girl. 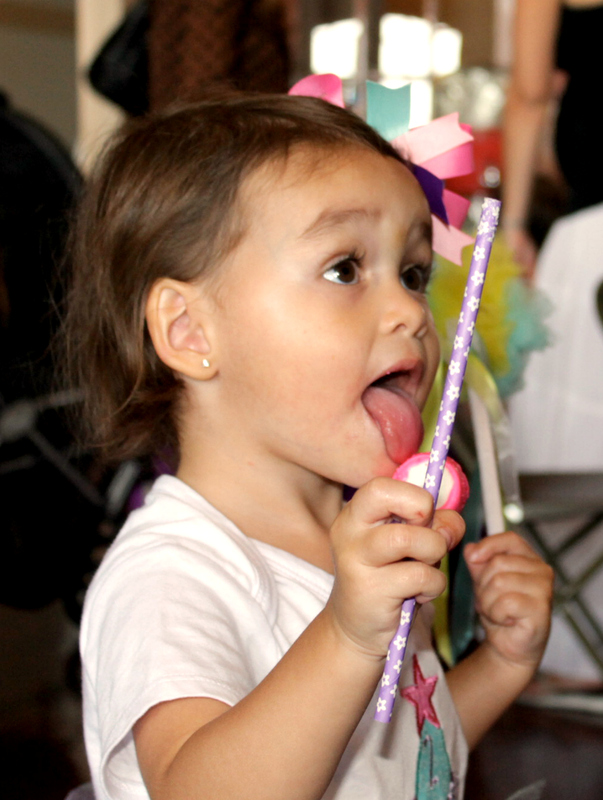 The party came & went and Josselyn and all of her friends and family had a marvelous time! 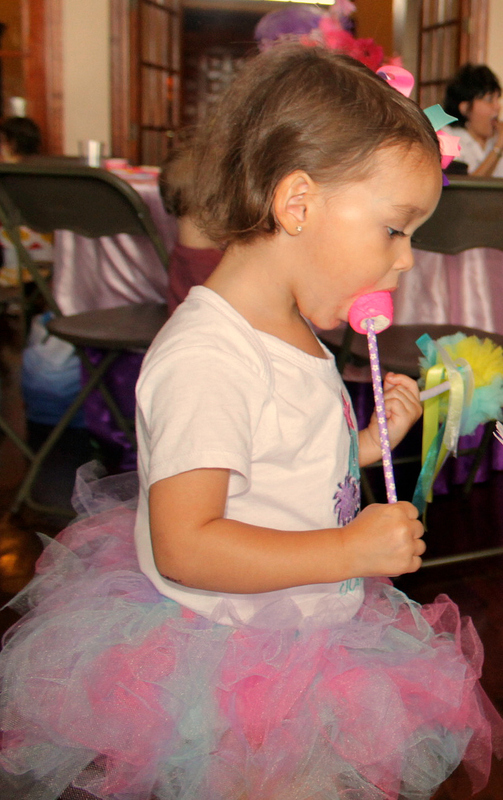 I had so much fun planning this shindig for my first born, baby girl and although I am a little embarrassed to admit it, I have already caught myself brainstorming for her birthday party next year haha! I could not have pulled this fabulous Abby Cadabby party off without the help of my amazing Mama & sweet friend Christina. Some of you may think this is a little over board for a 2 year old party (and I really tried to scale back this time!) but if you know me then you know that I go over board on everything I do; my friends baby showers, bridal showers, women's ministry events, etc. I love to decorate & through the years of hosting & throwing parties, my mom and I have accumulated a garage full of table linens, table toppers, vases, paper lanterns & tons of other decor! Believe it or not I actually had ALL of the table linens, sequins, paper lanterns, feathers & vases I used for this Abby Cadabby party. Anyways, I was very pleased with how it all came together & my little birthday princess had the time of her life! Here are some pictures from her magical Abby Cadabby Pool Party! I loved how the Decorations turned out! I (well my hubby & his friends) hung shades of pink & turquoise paper lanterns from the celing in the ball room where we had the party. When you are having a party in a huge room you have to figure out some way to make the room seem decorated. I loved the big statement the paper lanterns made. It has become a "tradition" for us to have a book for the guests to sign when they arrive. 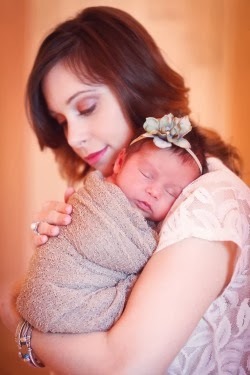 We did this at Josselyn's baby shower Cirque Du Bebe! and 1st birthday An Under the Sea Mermaid Party! I searched high & low for an Abby Cadabby hard cover book but had no luck. I ended up using a Sesame Street's Mother Goose Rhymes book instead. When it comes to showers/birthdays, people of all ages love to win prizes! I always have the guests self address an envelope for a raffle. The guests have fun winning a prize and it makes it easy on me to send thank you cards because the envelopes are already addressed! The guests also grabbed a party hat as they came in! If you remember from my last post, I decided not to hand make every single party hat this time around. However, I did have to embellish them a little so I added pink, purple, & turquise glitter tulle coming out of the hats. My mom just couldn't resist making the birthday girl and her baby sister "special" party hats', so Josse & Jewel did have adorable custom made party hats from their Yaya. My mom made a gorgeous wreath to hang on the door to the club house! You knew from the get go that this was an Abby Cadabby fairy party! The table centerpieces turned out so pretty! I ended up sort of copying the idea I saw on Pintrest that I blogged about in my last post. I bought the Abby Cadabby treat boxes and cut out the Abby faces and glued them together. But instead of putting them inside the vases, I just glued the faces on skewers and stuck them in an arrangement of flowers. I love having flowers at home so I figured my mom and I could just use the flowers in our house after the party. Lucky for me, my friend Jen use to be a florist so she made the flowers look gorgeous in the Dollar Store vases I had! I already had the linens so I decided to just purchase some Abby Cadabby fabric from Hobby Lobby (of course I used my 40% off coupons). The fabric really helped get the "Abby" theme across! I love making birthday banners especially with my mom's amazing Cricut machine! I ended up making 3 Abby inspired banners for the party! It took forever to make these because I had to work on them during Josselyn's nap time each day. These banners are so cute but they take soooo long to make. Everyone says we should make banners and sell them but I honestly do not think it would even be worth the time it takes to make these suckers!!! It is not easy coming up with food ideas for a 2 year olds party. I ended up doing a variety of kid friendly food like Elmo face PB& J, magical trail mix with sprinkles, Sesame Street character fruit & veggie platters, Abby bow pasta, a few other dishes & some fairy punch. You can not have an Abby Cadabby party and not have some "magical treats" for the kids! I decided to serve Abby cake pops , cupcakes, Abracadabra wands (chocolate dipped pretzels), fairy wands (rice crispy treats), and chocolate dipped marshmallows. Josselyn's very favorite treats were the chocolate dipped marshmallows that Auntie Christina made! Now according to Josselyn a birthday party means one thing and one thing only....CAKE. I was actually not going to have cake at her party because I was going to do a whole table of desserts. But, every time my mom would ask Josselyn what she wanted for her birthday she would say "Abby Cake". Needless to say, Yaya made sure Josselyn had an Abby Cadabby cake at her birthday! Since this was a pool party I didn't go all out with games, but I did have some Abby faces for the kids to color while they ate. I went pretty simple with the party favors. All of the kids took home a Sesame Street color book, a box of crayons & an Abby wand with a marshmallow treat on it! All of this hard work party planning paid off when I saw how much fun Josselyn and all of her guests were having! We had around 60 of our family & friends join us for Josselyn's 2nd birthday celebration and as I looked around the room I was so grateful to have all of these wonderful people in our lives. We ended the party with a little bit of swimming! The birthday girl insisted on taking a bouquet of balloons out to the pool with her haha. Thank you fairy much for checking out my blog & I hope you enjoyed all of the pictures from Josselyn's Abby Cadabby Birthday party! I loved the birthday cap and cake. They both are awesome. Also you have done best possible preparations. We can say it as perfect birthday party. If you don't want to celebrate parties at home, party venues in los angeles will serve you good. You are seriously my inspiration! You plan the most beautiful party's! What kind of sticks did you use for the marshmallow pops and where did you find them ? - thanks!! Awww thanks! They are actually straws from Hobby Lobby! In search of Abby Cadabby party ideas I was lucky to have found the pin you had on pinterest. You really did such a fun, beautiful and creative job for Josselyn's Abby Cadabby Birthday party that I just had to try and replicate for my own daughter Jasmine's 1st Birthday party. Question, where did you find the long feathers. Trying not to spend too much either. Also, how long were those orstrich feathers you added to the flowers?